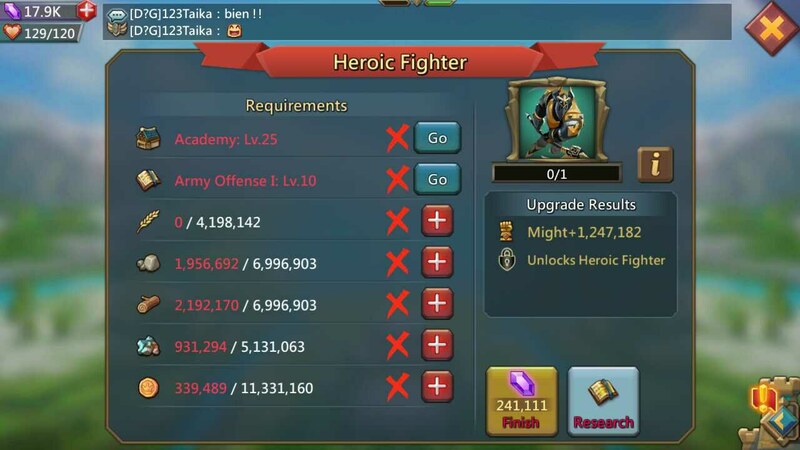 Unlocking t4 is a biggest achievement in lords mobile. It takes atleast 1 year. We easily unlock first 3 tiers within 4 months but unlocking T4 is not that easy. When we see in academy t4 troop requirements says just academy level 25 and second is military research – Army offence level 10. It sounds easy but it is not. 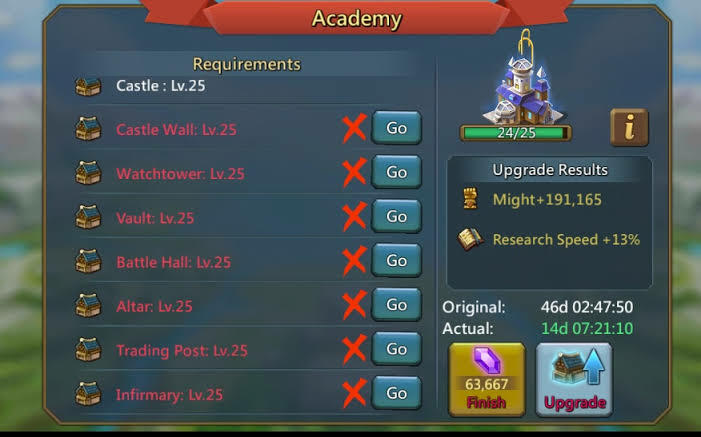 1.Academy – Requirements of academy are to upgrade every kind of building to 25 level including Altar, battle hall, Prison and treasure trove. Requirements are 19820×3 (steel cuffs, war tome and soul crystal). and 5000 crystal pickaxe. which costs purchase 1 = 20 gems , purchase 10 = 160 gems ( 16 gems each), purchase 100 = 1500 gems (15 gems each) and purchase 1000 = 14000 gems ( 14 gems. per each).For battle hall, prison and Altar – purchase 1 = 15 gems, purchase 10 = 120 gems ( 12 per each ), purchase 100 = 11000 (11 per each) and purchase 1000 = 10000 gems ( 10 per each). 2.Research – Direct way of unlocking t4 is Army offence but you need other to unlock it. 3. Requirements – It need alot of resources to research and need gems to buy material like Steel cuffs, War tomes, Crystal pickaxes and Soul'crystal.